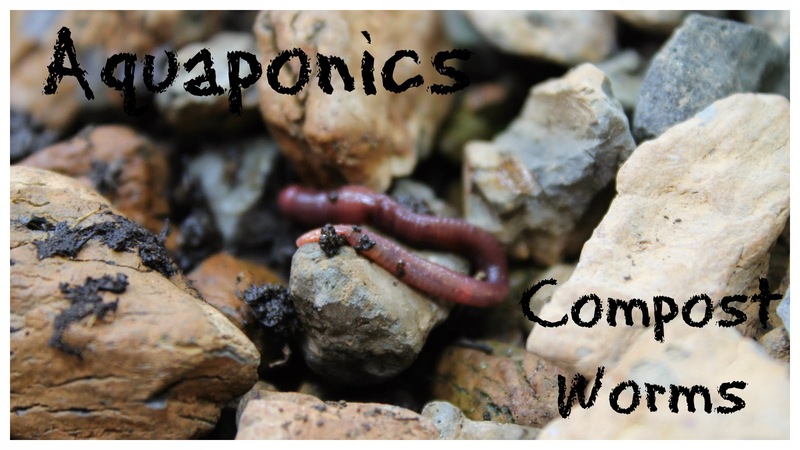 Check out this video to learn more about using compost worms in an indoor aquaponics system. I have been waiting for quite a long time to have enough worms and the right conditions to start adding my red wigglers to the aquaponics grow beds. Today is that day! I started a very basic worm bin almost a year ago and have although it started out pretty rough it has really started to be a constant source of worms and worm castings for various gardening projects around the homestead. I have learned to pace feeding the worms to a minimum until the population is big enough to consume everything you are throwing in the bin. So, with the bin working well and the worms multiplying like, well, like worms, it is time to start taking some out and taking them to the water park AKA the aquaponics system. I am just going to be adding small amounts of worms to the grow beds each month. This will give the worm population in the worm bin a chance to recover and for more organic "stuff" to build up in the beds for them to feed on. I am excited to get the worms going in the beds as I have heard nothing but great things about this additional symbiotic relationship. The worms are going to help plants grow even better and work as an additional cleaner for the water and grow beds. The idea with the compost worms and aquaponics is that you are always going to have uneaten fish food, dead roots, fish waste, and other organic material that build up over time in the grow beds. Over time this can cause quite a mess and cause you to have to empty the entire bed and clean things up. With the worm in there doing their work the time in between cleanups should be much greater and in the meantime the worms are breaking down that extra waste into more nutrients for the plants. Many people have suggested that the worms should be used in place of a swirl or radial flow filter and that is something that I do not agree with. There is just too much waste that would get into the grow beds too quickly for the worms to keep up. I think that the ultimate solution to the solids waste problem in a flood and drain system is to utilize both some kind of settlement filter and the worms together. I have demonstrated in several videos just how much waste builds up in the beds in just a short amount of time and I just don't think that worms alone, as awesome as they are, can keep up with the cleanup duties. Hello! My name is Ryan and I first would like to say thank you for all the you and your family has posted. My family and I also live in SE Michigan and can relate to many of your circumstances. My question(s), though not relivent to this post, are: How much more has your hydroponic system increased your energy bill? Do you think the system could run off of a solar energy setup? Thanks Ryan! I have some detailed info on the costs and setup of the system in this post and video - http://www.simplesuburbanliving.com/2014/11/aquaponics-system-design-setup-and.html. Not to make you read another post but it breaks everything down so you can see how much it costs to run. I am in the process of testing some LED lights in the upcoming months which has the potential to cut running costs in half. Thanks for the interest and let me know if you have any other questions! God Bless! !